Prairies occur world-wide, generally in the interior of continents. 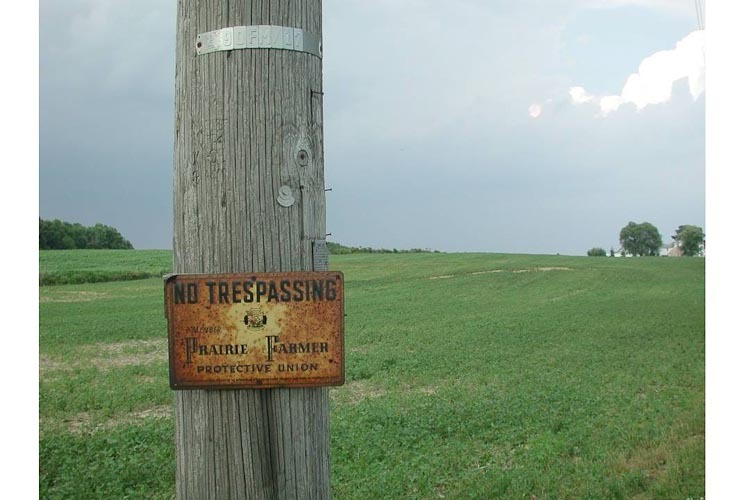 North American prairie is drier in the west, bordering desert, and the type of prairie that occurs there is called “shortgrass prairie.” In the moister eastern half, adjoining deciduous forest, there is “tallgrass prairie.” Ohio is not usually thought of as a prairie state. Here are two maps from authoritative publications. Note how one shows us well outside the prairie biome, while the other correctly a few scattered prairie patches well within our boundaries. 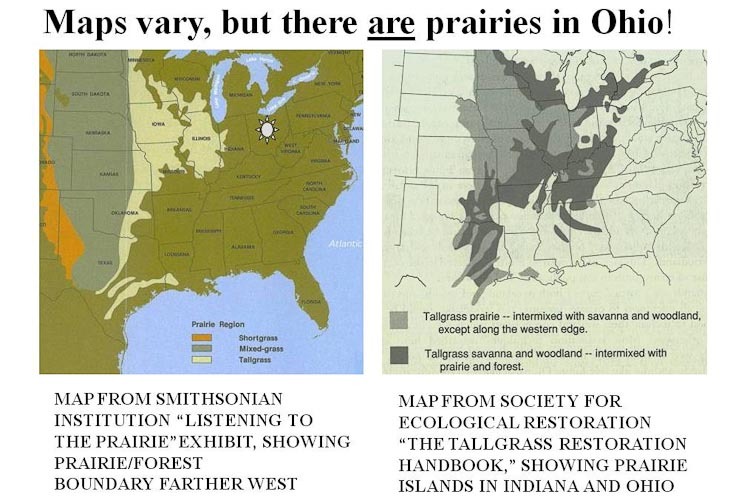 Maps vary, but there are prairies in Ohio. Generally, where there is adequate moisture year-round, trees can survive, and so the principal vegetation type in Ohio is forest. 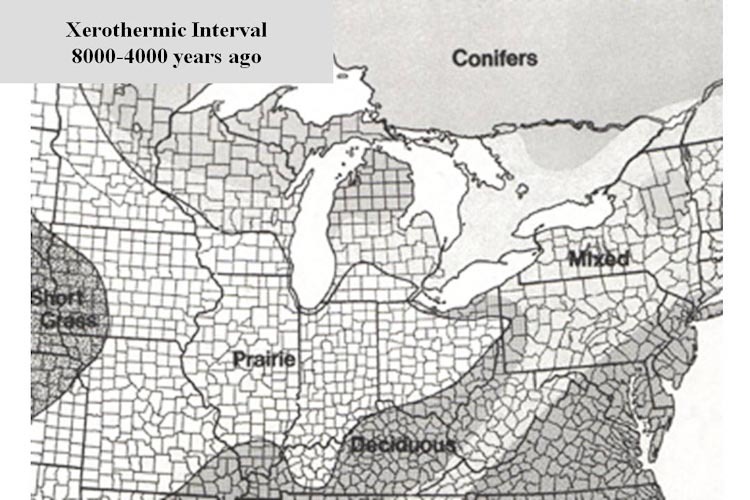 It is believed that the prairies in Ohio, which comprised only about 1% of the state (and, sadly, of which only about 1% remain) are remnants of a time between 8,000 and 4000 years ago called the “Xerothermic Interval” when the climate was hotter and drier than today, and prairie extended as an eastward-projecting tounge across present-day Ohio, called the “Prairie Peninsula.” Fires deliberately set as a game-management tool by Native Americans are believed to have helped maintain a few prairies into the present day.Today, fire is still used as a management tool to maintain prairies. The principal benefit of fire is to eliminate woody vegetation, as the above-ground buds on tree saplings are susceptible to being killed by hot flames. 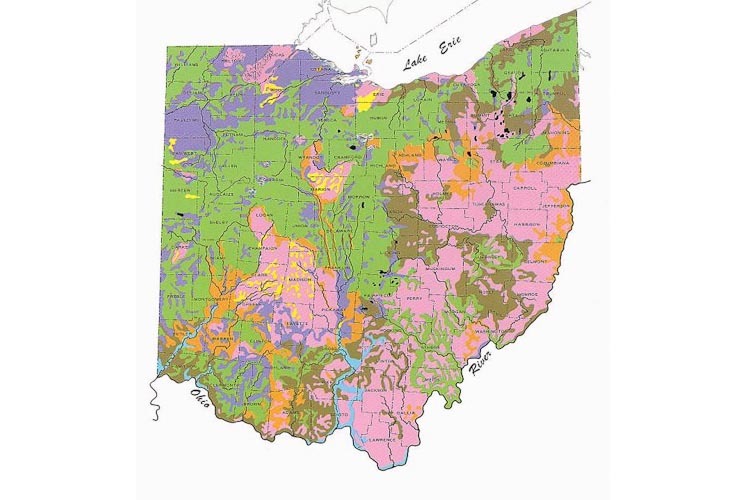 In the 1950’s, Robert Gordon mapped the vegetation of Ohio during pre-settlement times, using data from the earliest land surveys. On his famous map below, prairie is indicated in yellow. Notice please that there yellow patches are not scattered uniformly across the state, but are in discrete regional patches. Gordon’s Original Vegetation Map, with prairie in yellow. Prairies, having soil high in organic matter and lacking trees needing labor-intensive removal, and well-suited for agriculture. Hence, it is primarily conversion to farmland that has caused the elimination of nearly all of the North American prairies. Nearly all of our prairie has been converted to farmland. In Ohio and elsewhere. 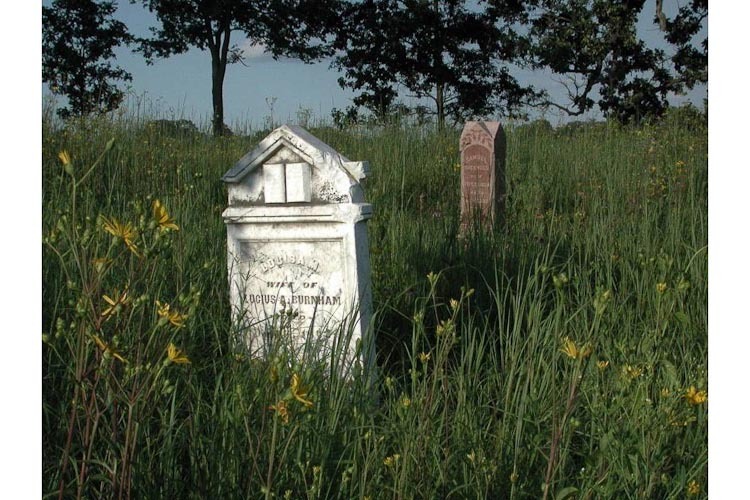 There are three principal types of prairie remnants: pioneer cemeteries, railroad rights-of-way, and lightly grazed areas. Smith Cemetery in Madison County is a beautiful little (1 acre) State Nature Preserve. Smith Cemetery is a 1-acre prairie remnant. Railroads generally maintain a strip of land alongside their tracks that is untouched by the plow. Here’s one in Union County, called Milford Prairie which is also a State Nature Preserve. 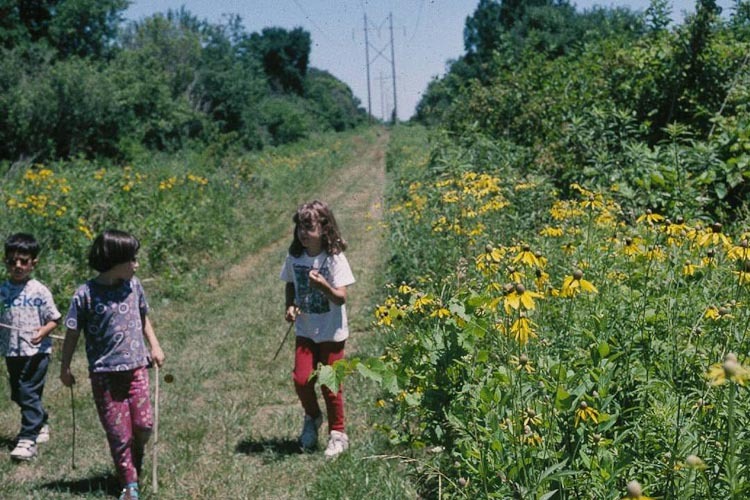 Milford Prairie was once a railroad right-of-way. Since it’s woody vegetation, including native trees, that constitute a threat to prairies, light grazing that allows grasses to remain, can be a mechanical alternative to fire. In Crawford County, Daughmer Bur Oak Savanna is a grassland recently, supported a small herd of sheep. “Savanna” is the term for a grassland with scattered trees. 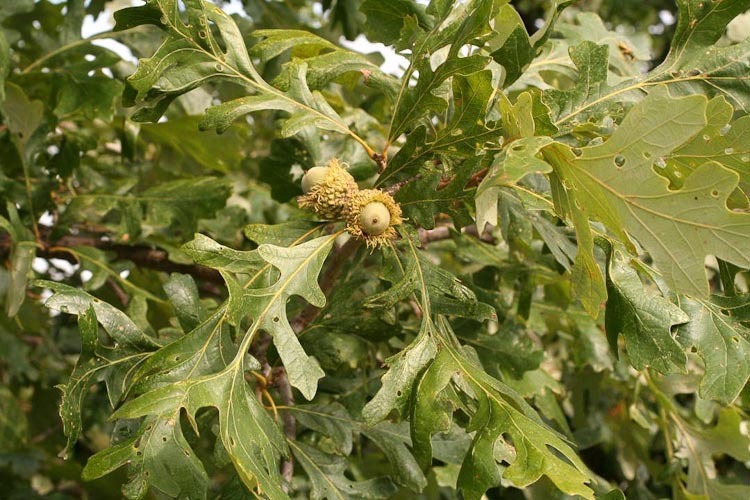 In the tallgrass prairie region, bur oak (Quercus macrocarpa) is the tree most often seen scattered in prairies. Q. Hey, what’s the coldest tree? A. Bur-oak (brrr-oak?). Q. What was J.S. Bach’s favorite tree? A. Bur-oak (baroque?). 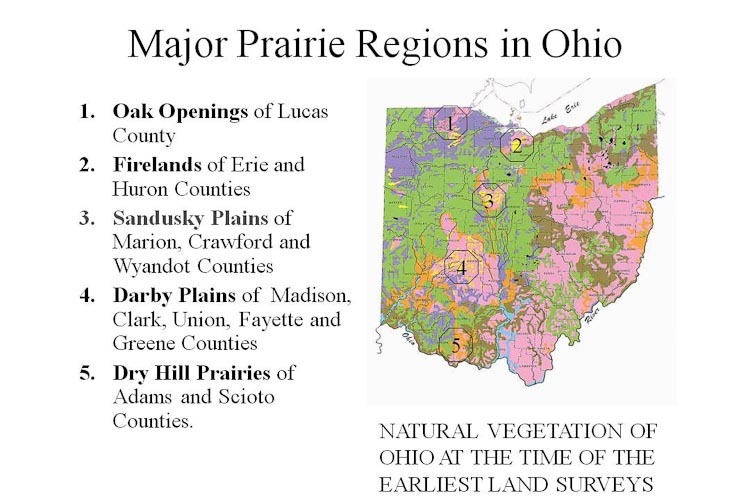 In Ohio we have a few regions where prairie is found, shown on the map below. The “signature grass” of the tallgrass prairie is big bluestem., Andropogon gerardi. 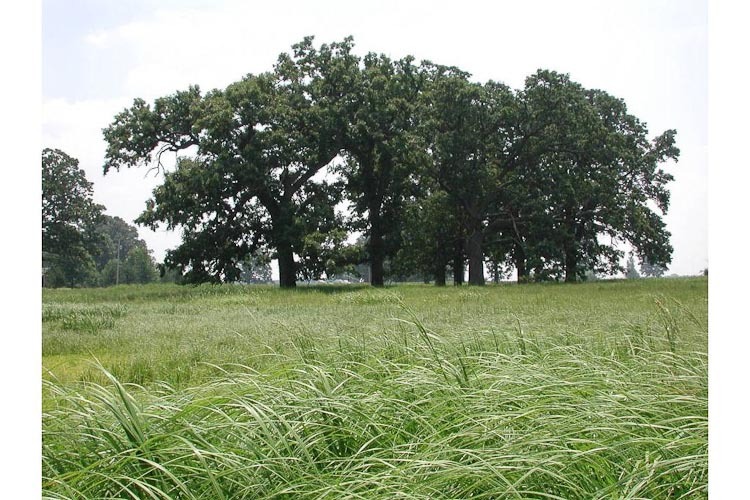 Big bluestem is the signature tallgrass prairie grass. Its nickname is “turkey-foot,” because its spikelets are in a few spikes. 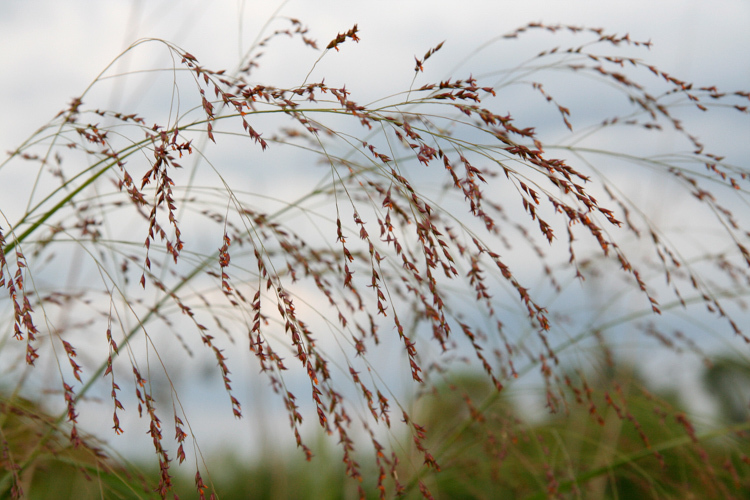 Indian grass (Sorghastrum nutans) is another robust prairie grass. Its spikelets contain conspicuously awned florets arranged in loose panicles. 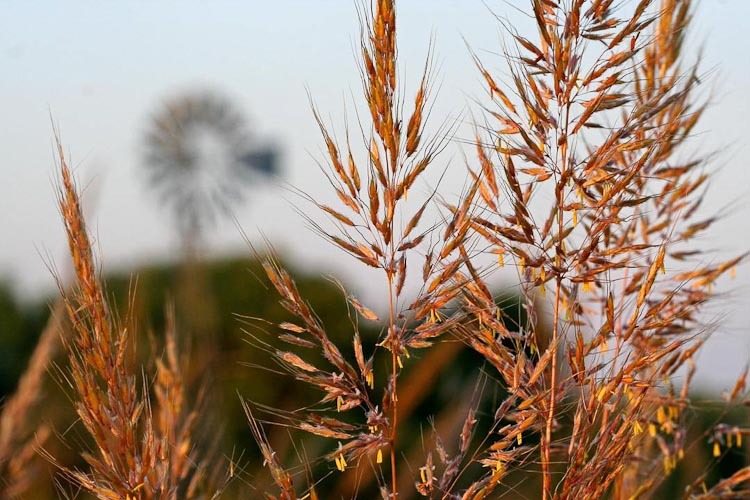 Indian grass is a robust prairie grass. Tall nodding rye (Elymus canadensis) produces spikelets with long awns in drooping two-sided spikes. 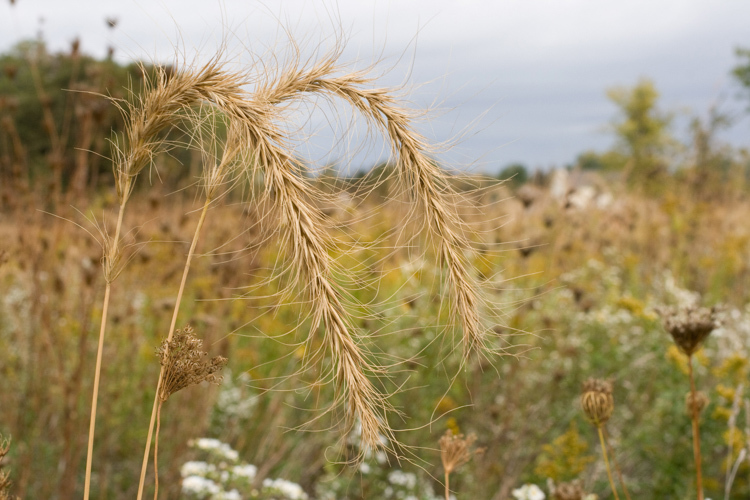 Tall nodding wild rye has a drooping 2-sided spike of spikelets, with long awns. Switchgrass (panicum virgatum) does kind of seem like it’s panicking, as the spikelets are widely spreading on a diffuse panicle. 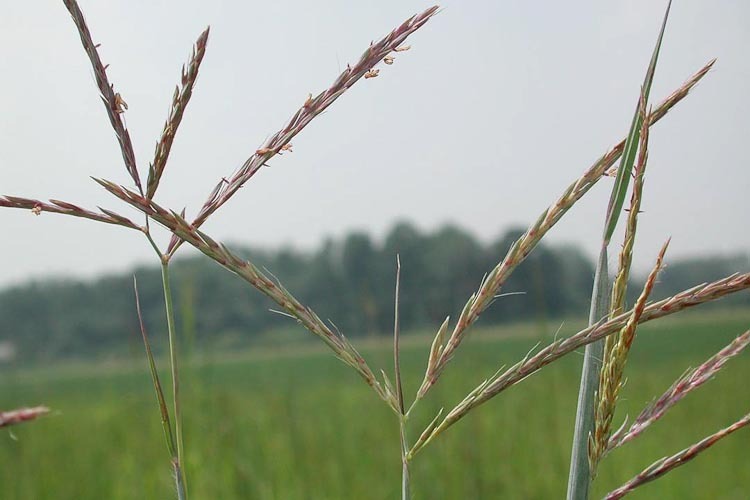 Switchgrass produces a bushy panicle of one-flowered spikelets. The aster family is especially well represented in the tallgrass prairie. 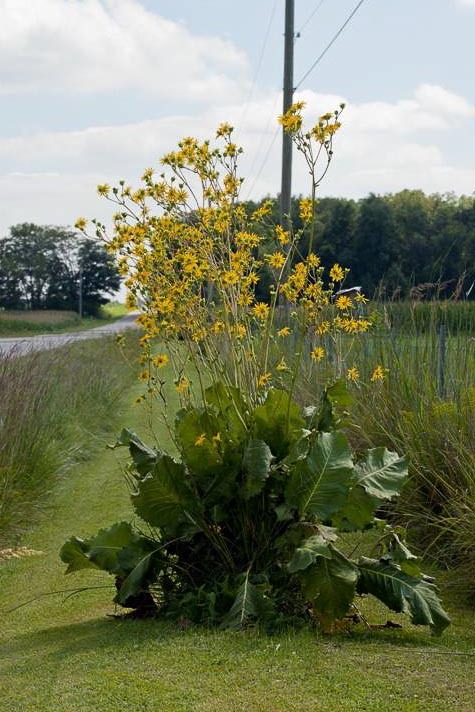 The signature prairie forb is one of these; it’s prairie dock (Silphium terebinthinaceum). “Dock” is a general term for a plant with especially large leaves and, prairie dock sure fits that description. Prairie dock is a large-leaved composite. 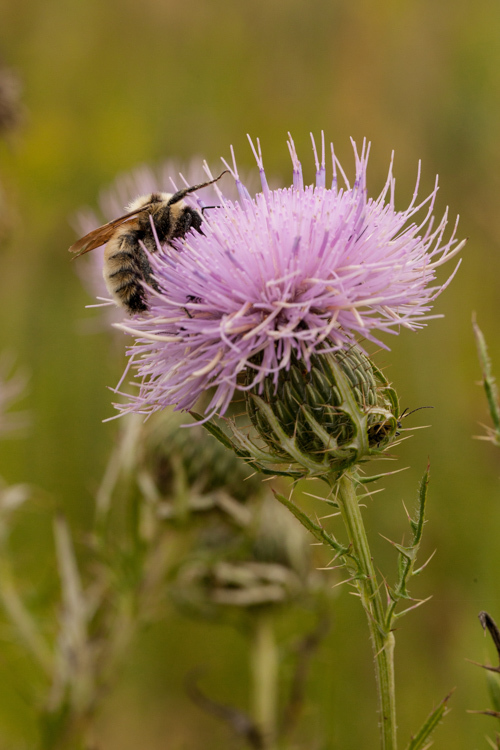 Pasture thistle(Cirsium discolor) is a composite with purple-flowered discoid capitula. The plants are quite spiny. The are avidly visited by a variety of bees and butterflies. Pasture thistle has spiny phyllaries, large capitula, and spine-tipped leaves . Sawtooth sunflower (Helianthus grosseserratus) is a tall, very typical “composite” (aster family member having a radiate capitulum). The flower heads have ray flowers that do not produce achenes; only the center (disk) flowers are fertile. 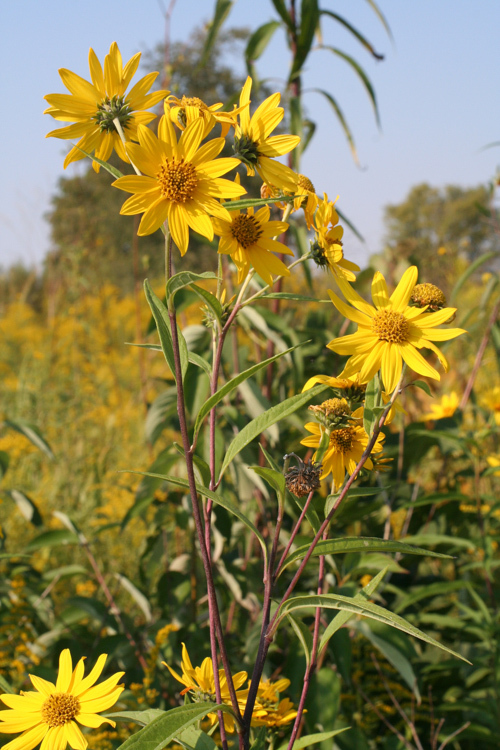 Sawtooth sunflower is tall, flowers in lare summer, and has a radiate capitulum. Stiff (also called “hard-leaved”) goldenrod has especially large and bright golden-yellow flower heads, and short rough stalkless leaves with parallel margins. 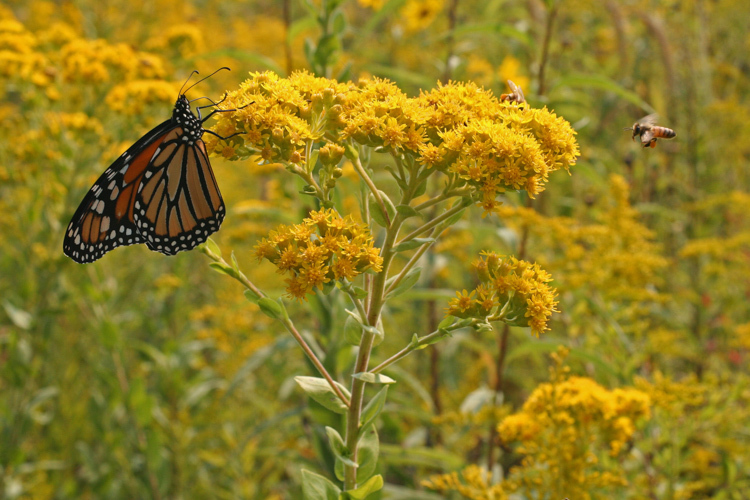 Stiff goldenrod is especially colorful. Perhaps because they have nitrogen-fixing bacterial root nodules that assist growth in nutrient-poor soils, members of the fabulous Fabaceae are prevalent in prairies. 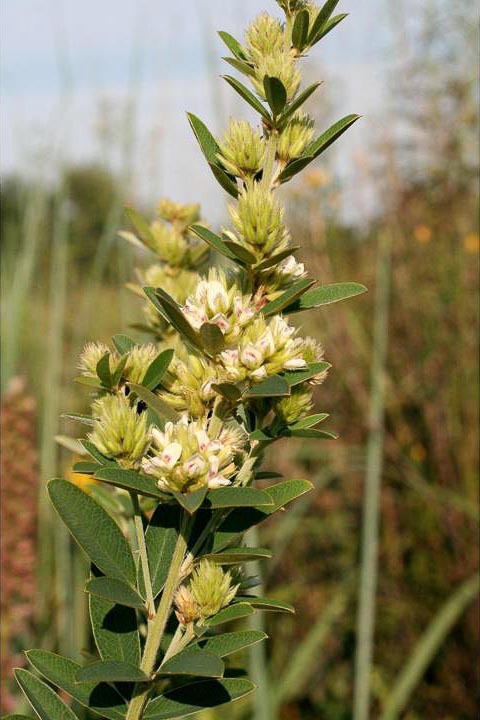 Round-headed bush-clover (Lespedeza capitata) is a wand-like scruffy-looking legume with small whiteish blossoms arranged in confluent head-like clusters. False white indigo (Baptisia lactea) is a very open-branched diffuse plant with thickish, almost succulent leaves. The center/upper portion of the plant produces a panicle of shite pea-like blossoms. 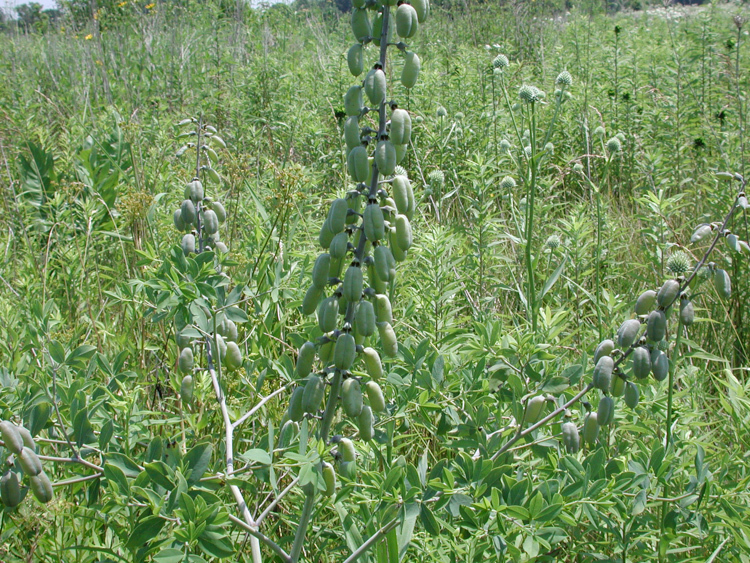 They mature into elliptical swollen-looking fruits (legumes). In flower, false white indigo blossoms are large, typical legume family flowers with an architecture that directs bees to contact the stamens and stigma. 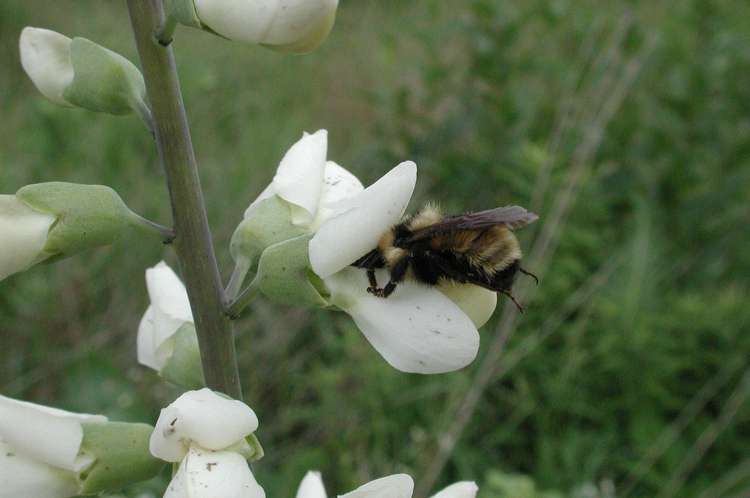 False white indigo flower with bumblebee. 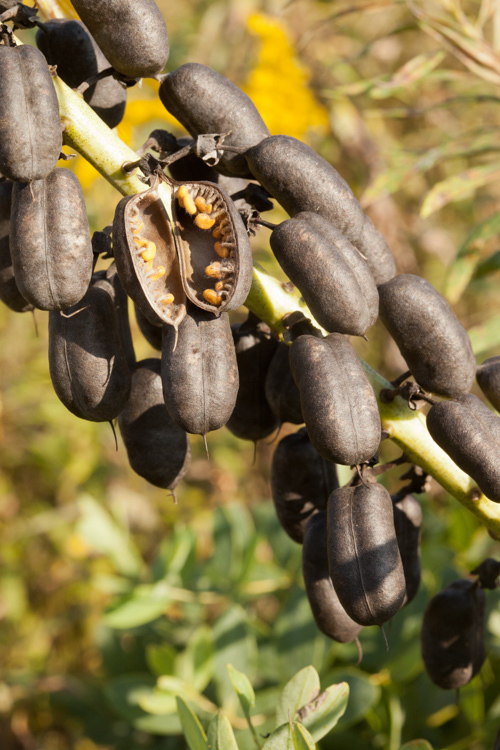 The false white indigo fruit is an expanded legume. False white indigo fruits. One is opened to show seeds.